KIEV, Ukraine -- As eastern Ukraine is experiencing some of its heaviest fighting since the Minsk II agreements were signed in February, a captured Russian army major tells Euronews there are about 2,000 Russian servicemen fighting in Eastern Ukraine. Starkov, who is being charged with terrorism, explained to Euronews that he was recruited to help separatists in Eastern Ukraine. He was in charge of weapon accountability. 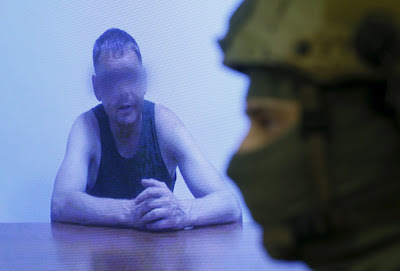 “At the time I was detained, I was a regular serviceman in the armed forces of the Russian Federation with the rank of Major," Starkov told Euronews. "I was chief of missile and artillery weapons service in the military unit in the Russian city of Novocherkassk." “Senior officers gathered us in a conference room and announced that our positions would be the same as promised, but we should do our military service in Ukraine: in the Donetsk and Luhansk People’s Republics," he said. "It was forbidden to inform our relatives about this." Once he was arrested, Starkov tried to call his family but couldn't get through to them. The same happened when Euronews tried to call them. The Russian Defense Ministry and Russian Embassy in Kiev both did not respond to Euronews’ request to comment on Starkov’s identity. Although Russia has consistently denied sending servicemen to Ukraine, many reports contradicting their statements have surfaced. The unrests eventually led to the ousting of Ukraine's Kremlin-friendly puppet, then-President Viktor Yanukovych. The fighting started escalating following the annexation of Crimea by Russia in March 2014.